Eric showing me some of his celebrity portraits. Continuing my series on StudioWorks, today’s episode features Eric Huggins. Eric is a soft spoken guy, but super friendly—he always seems to have a smile on his face. His artwork reflects that upbeat disposition with his color usage & subject matter. 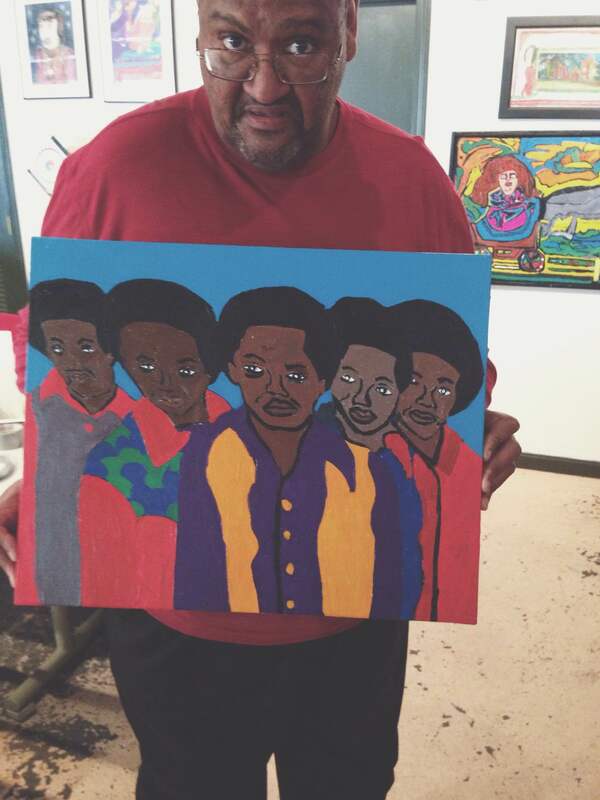 Eric’s work is inspired by his love of music, especially Motown, and usually comes in the form of celebrity portraits. Aside from his colorful portraits, Eric dabbles in tattoo influenced work as well. More of Eric’s work. Photo from StudioWorks’ Facebook page. I love that embroidered Elvis. Eric is a self taught artist who’s been at it for over 20 years now. Quite a bit of those years have been spent learning and experimenting at StudioWorks, which has given him the opportunity to try new things as well as pass down his experience to children at the Pitt Academy. Eric teaches an art class about once a month with Pitt Academy students. You can learn more about Eric and the rest of the StudioWorks crew at Zoomgroup.org or the StudioWorks’ Facebook page. Check out our chat below.